Well, today I am doing a post on where Universal Studios Singapore is exactly, and putting it into perspective for all of you. Why am I doing it? I figured out that those of you who don't live in Singapore wouldn't know where Universal Studios Singapore is going to be in and what significance it has for Singapore. So I am set to correct this from this moment onwards. Universal Studios Singapore is located in Resort world at Sentosa at Sentosa island. So where and what is Sentosa? Sentosa is an island resort, off mainland Singapore, where there are attractions, hotels and sandy beaches for a weekend getaway. Here is the map. 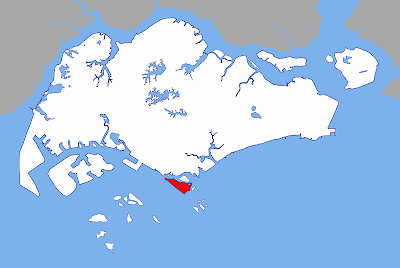 Sentosa shown in red. So where is Universal Studios Singapore located? 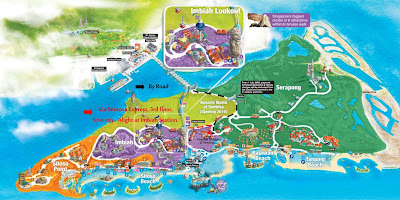 It is located on the area marked in light green on the map above, called Resort Wort at Sentosa. 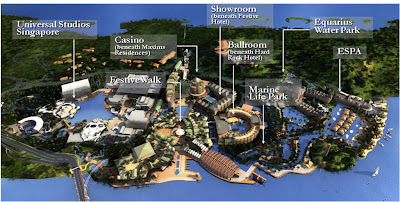 So the story about Resort Wort at Sentosa is that it is a Integrated Resort built on the Island by Genting Singapore. It consists of Universal Studios Singapore, a casino, some hotels, and some other attraction. The link to official website here. So for those of you who think that Universal Studios Singapore is a independent project, it is not. All pictures belongs to respective companies and individuals. 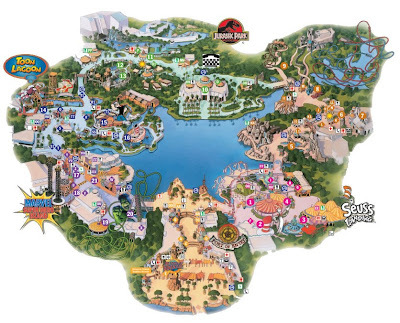 There are many similarities between the Universal Studios Singapore and the IOA theme parks, some of them include general layout similarities, ride placement similarities etc. 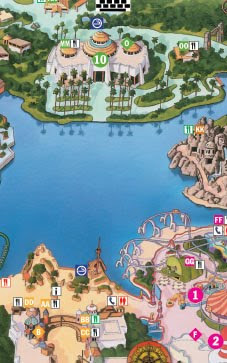 The general layout of both IOA and Universal Studios Singapore are all in the shape of the themed lands circling the lagoon, with a looping walkway connecting the lands, rather than a immersive "walk-in-and-disappear-into-the-back-alleys-and-sidewalks" layout of most of the disney theme parks. 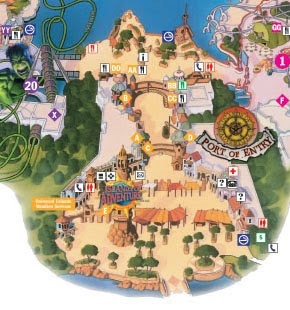 This layout of Universal Studios Singapore and IOA provides some advantages and some disadvantages. The advantage is that you will never get lost in this setting, as you are always guides by the lagoon and walking in a loop around it. It also provides a open space in the middle of the park for people to be physically separated in different lands, but able to see what is happening in other lands. The central lagoon also provides a platform for a night time spectacular if Universal Studios Singapore chooses to have one. But however, it also provides some disadvantages. Firstly, the lands are all located very close to each other, and there is no theming elements to conceal one land from the other. For example, it is possible to see the Sci-fi city with the Battlestar Galactica Coaster right by the side of an Ancient Egyptian temple in Universal Studios Singapore. Ancient Egypt on the left, Sci fi city on the right. Also, it is impossible to have a immersive experience in this layout as the lands are just a central street with buildings at the side, and you are going to walk right through the land, without getting swallowed into the land and linger in the land. 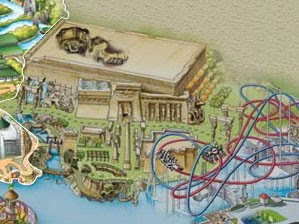 For example, in the Ancient Egypt land in Universal Studios Singapore, it is just simply a walkway connecting the Lost world land to the Sci fi city, walking right by a ancient Egyptian facade, and that's about it for that land, with no side walkways or areas concealed from the main walkway for people to explore. 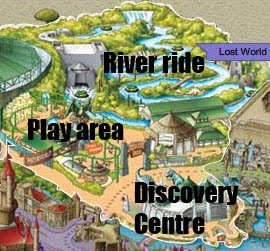 Also, the Jurassic Park land in both theme parks are also similar in the rides and the layout, with both of them having a river ride, and childern's play area and a recreated Discovery Center from the movies. IOA on top, USS below. Thats about it. More posts to come! All artworks belong to respective companies. Today, I will be discussing about the park layout of USS, the similarities with other theme parks and the uniqueness of the layout. 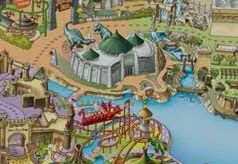 The seven themed lands of USS will encircle a central lagoon. 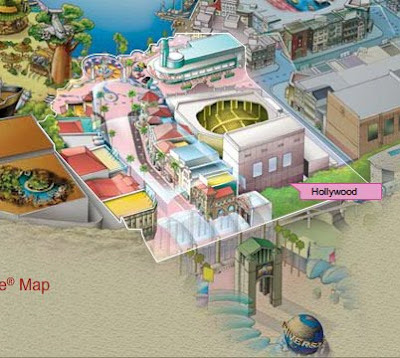 The entrance to the park will be located at the Hollywood themed area. 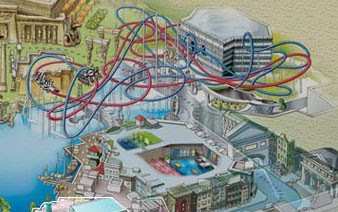 Immediately, when I saw this layout, Universal's Islands of Adventure came into my mind. For those of you who don't know what Islands of Adventure is, it is a theme park built by Universal Studios in Florida. Islands of Adventure on top, USS on the below. Well, they are all similar in the sense that they all encircle a lagoon with different lands and rides on the "shores". Also, the entrance are all similar as they are all a single avenue leading into the park. IOA's entrance above, USS's entrance on the right. 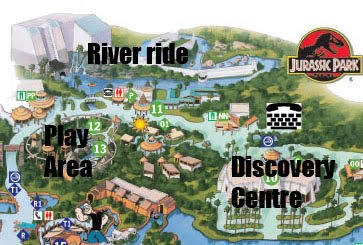 Also, one interesting point to note is that the theme parks both have a Jurassic Park themed land on the opposite side of the lagoon from the entrance, with the Discovery Centre and the main focal point of the whole park. 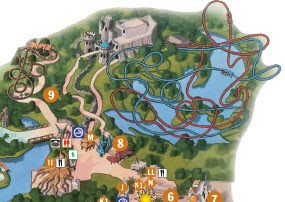 Also, they do have a dueling roller coaster on the top right of the park, adding as a visual icon to draw visitors into the back section of the park. Thats all for today, more to come tomorrow. All artworks belong to respective companies and individuals. Hollywood producer and director Steven Spielberg lent his hand to boost the profile of upcoming Universal Studios Singapore as the city-state tries to drum up Hong Kong interest in the project. Spielberg helped create the theme park - part of a bigger integrated Resorts World - which, its backers claim, will not compete with Hong Kong Disneyland. Featuring 24 rides and attractions, the US$4.4 billion (HK$34.32 billion) resort, developed on Sentosa Island, will open in the first quarter of next year and it expects to attract 13 million visitors within its first 12 months. In a five-minute video clip, Spielberg said. "I am excited to help create Universal Studios Singapore ... a spectacular destination for the people of the region and the people of the world ... a place where our imagination becomes world reality," he said. "Universal gives the people an opportunity to ride the movies." 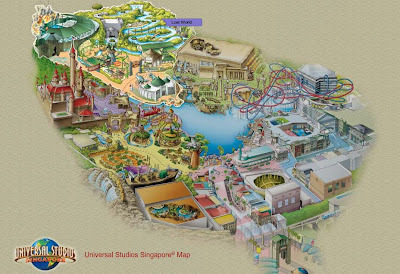 Universal Studios Singapore will have attractions based on movies such as Jurassic Park, Shrek and Waterworld. "I am particularly excited about the DreamWorks Animated theme lands of Far, Far Away and Madagascar," he said. Visitors "will be put inside, making them the superstars. These memories can last a lifetime." Edward Koh Boon Wee, chief representative regional director for Greater China of the Singapore Tourism Board, said Hong Kong is an important market for the city-state. food, shopping and buying our local products. I hope the integrated resorts will give them more entertainment options to stay another day, another night on the island," Koh said. Universal Studios Singapore will target Asia as its key market. "We call it the integrated resort and it is all encompassing. It is similar to the positioning of Singapore as a global leisure destination and a convention and services city of Asia," he said. Koh does not think it will compete directly with Disneyland because they are "very different propositions." USS will be opening with 24 rides and shows in 7 distinct theme zones, which are New York, Hollywood, Ancient Egypt, Sci-fi city, Lost World, Far Far Away and Madagascar. On following posts, I will be discussing about the park's layout in detail, as well as introducing each of the themed lands and rides, and also discussing about Resort World Sentosa as a whole. So look out for more coming your way! Artwork belongs to respective companies and individuals. This blog will be dedicated to Universal Studios Singapore, and is a fansite. You can expect detailed ride reviews, pictures, concept art, news and more to come on ussingapore blog. So watch out for this space! The usssingapore blog is not affiliated with, maintained by, or expresses the views/opinions of the Resorts World at Sentosa Pte Ltd, and may contain copyrighted images. Most contents and specific downloadable materials are copyright Universal Studios Singapore or Resorts World at Sentosa Pte Ltd or other companies. However, if you don’t see a copyright on any material on the ussingapore Blog doesn’t mean that the document is not copyrighted. In the event you download any material from ussingapore blog, the download of the material, including any files or images must be for your personal, noncommercial home use only. You may not and cannot sell, print or reproduce in any way any material downloaded from ussingapore blog, and specifically any material copyright Universal Studios or any other companies. ussingapore blog does not warrant that the functions contained in the materials in this blog will be uninterrupted or error-free, that defects will be corrected, or that this blog or the server that makes it available are free of viruses or other harmful components. ussingapore does not warrant or make any representations regarding the use or the results of the use of the materials in this site in terms of their correctness, accuracy, reliability, or otherwise. You (and not the ussinapore or Blogger.com) assume the entire cost of all necessary servicing, repair, or correction.